↑ 2.0 2.1 "Page 12. Consecration of our encounters with God and Mary. 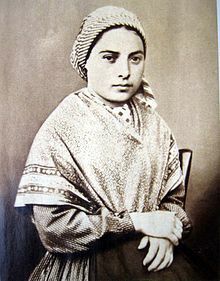 St Bernadette: February 18th". Florida Center for Peace. Miami, Florida. February 2007. Retrieved 30 September 2013. On may 13, 1913, Pope Pius X signed the decree introducing the cause of Bernadette's beatification. She was beatified on June 14th, 1925. Eight years later, on the feast of the Immaculate Conception, December 8, 1933 she was canonized by Pope Pius XI. ↑ 3.0 3.1 Ruggles, Robin (1999). Apparition shrines. Places of pilgrimage and prayer. Boston: Pauline Books & Media. p. 68. ISBN 0-81984799-2. ISBN 978-081984799-7. ↑ "Biography Bernadette Soubirous - Saint of Lourdes". biographyonline.net. Retrieved 17 November 2010. This page was last changed on 29 November 2018, at 15:35.